Taken from " Good Words ," 1874 and 1879; and United Service Institution Lectures, 1878 and 1880. From reprint in Popular Lectures and Addresses , Vol. iii, pp. 228-336. HUMAN inventions have generally grown by Evolution. Of perhaps no other than the Mariner's Compass can it be said that it came into existence complete in a moment. The person who first having a piece of loadstone or a magnet, so supported as to be moveable round a vertical axis, perceived it to turn into one particular direction when left to itself, and who found that the positions thus assumed were sensibly parallel when the suspended magnet is carried about to different places indoors or out-of-doors, near enough to be within sight of one another, invented the Mariner's Compass. There may have been several independent inventors; there can have been but one first inventor. The efforts of historical inquirers have hitherto proved unavailing to fix either time, place, or person for this invention, not more remarkable for its definiteness as a discovery than for its perennial utility to the human race. Hoang Ti was the third Emperor. The first date given in Duhalde's Annals is that of the death of the eighth Emperor Yao, 2277 years before the Christian era; and it is stated that the number of years from the time of Fohi, founder of the dynasty, and first Emperor, till the beginning of Yao's reign is very doubtful. Assuming the date of Tao's death to be correct, we may safely conclude that Hoang Ti must have lived some time about 2400 or at the latest 2350 years before the Christian era. Duhalde's work was founded on narratives written by French Jesuit missionaries who lived in China during the latter part of the seventeenth century, and before publication was most scrupulously revised and corrected, when necessary, by the Père Contancin, who had spent thirty-two years in China. It is impossible to doubt but that the narrative represents accurately the traditions current in China at that time. The instrument which the Emperor Hoang Ti is said to have used cannot possibly have been anything but a compass, as nothing else could have done what it is said to have done. It is then perfectly certain that at the time when the quoted tradition originated, the Compass was known in China. We have thus irrefragable evidence that the compass was known at a very early time in China, and fairly strong evidence for believing it to have been known there as early as 2400 years before the Christian era. The directive quality of the magnet, which constitutes the essence of the mariner's compass, was not known to the Greeks and Romans; for in the writings of Homer, Theophrastus, Plato, Aristotle, Lucretius, and Pliny, we find abundant evidence of knowledge of all the other ordinary magnetic phenomena, but not a trace of any knowledge of this most marked property. It is clear that of all those writers, or of the observers and experimenters on whom they had depended for information, not one had ever supported a piece of loadstone, or of magnetized steel, in such a manner as to leave it free to turn round horizontally: or that if any one of them had ever done so, he was remarkably deficient in perceptive faculty. "Flocke Vilgerdersen, a renowned viking, the third discoverer of the island, departed from Rogaland in Norway to seek Gadersholm (Iceland), some time in the year 868. He took with him three ravens to serve as guides; and in order to consecrate them to his purpose he offered up a great sacrifice in Smärsund, where his ship lay ready to sail; for in those times seamen had no loadstone (leidarstein) in the northern countries. In Icelandic, Leid signifies region, and on this account the polestar is named Leidstjerna, consequently Leidarstein signifies guiding-stone. According to the testimony of Snarro Sturleson, Are Frode was born in the year 1068. This account was therefore probably written about the end of the eleventh century." Lor font a laguille alumer. C'est uns ars qui ne puet mentir. To which iron adheres of its own accord. Of the situation of the star towards the point? This is an art which cannot deceive. In this passage, the words, "and the straw keeps it above," imply undoubtedly that the needle was to be floated in water by the straw. The experiment thus described by Guiot of Provence is familiar to the present generation, being taught by Peter Parley, The Boy's Own Book, and other eminent scientific instructors of the young: and any reader of Good Words, having access to a little bar magnet such as that used for attracting magnetic swans, may make it for himself. Guiot says "this is an art that cannot deceive," but I doubt whether any one repeating the experiment carefully will agree with him. The mode of support is not satisfactory. Water in an open basin scarcely ever has its surface free enough from dust or other impurities to allow a straw floating on it to turn with perfect freedom; and it will be found that the needle will sometimes stick in positions sensibly inclined to one definite line towards which it tends, or at best that it will come very sluggishly into its proper position. A pretty and instructive experiment may, however, be made by deviating a little from the ordinary way of floating the needle. Instead of placing it lengthwise on a straw, stick it transversely through one end of a small round wooden bar. The smooth round stem of a fine kind of wooden lucifer match, sometimes met with, answers very well, the head with the inflammable substance being of course cut off; but the stem of an ordinary match may be taken, one end of it slightly flattened to allow the needle to be pressed through it easily, and the whole thinned away so much that it will just barely float the needle. The needle must be adjusted so that it will rest horizontally with the wooden bar vertical over it. The bar ought to be longer than half the length of the needle, otherwise there is a difficulty in preventing one end or other of the needle from rising to the surface of the water. If the bar is seen to project even so much as one-tenth of an inch above the surface of the water, it should be cut shorter; and the part of it at the surface of the water, when finally adjusted, ought to be nicely rounded. After completing this adjustment, which may require a little patience, pull the needle out from the wooden stem, and steady it upon a table by aid of two fingers. Draw one end of the bar magnet once along it steadily from eye to point. Replace the needle in its proper position on the wooden stem and float it. It will then be seen to turn into a position not very much different from the true north and south line (unless the experiment be made far north in North America, or far south in the Antarctic regions). If turned out of this position and left to itself again and again, it will turn again and again into the same position, and always with the eye and point similarly situated as to north and south. Suppose, for example, the eye turns to the north and the point to the south. Remove the needle again, and go through the same operation as before, several times running. Replace it in its floated, and it will be found to turn decidedly faster into the north and south line than before. Again take out the needle and go through the same operation, only with the other end of the bar magnet from that first employed. Replace it on its floater. You will now find it turning much less rapidly into its former position, or possibly turning into the reverse position. Take it out, and repeat several times the last operation, with the bar magnet. After having done this a sufficient number of times, you will find the needle turning its point to the north and its eye to the south. Or again, the magnetism once given by the little magnet may be reversed by drawing the same end of the same bar-magnet in the contrary direction a sufficient number of ties along the needle. If, however, the needle has been magnetized by a more powerful magnet, it may be found difficult or impossible to reverse its magnetism by the simple operation described above. A convenient way of testing the direction shown by the needle, is to draw a black line on a piece of white paper, and place it below the tumbler of finger-glass. Turn the paper round until the needle, resting in the centre of the glass, is seen to be exactly over the line. Deflect the needle from this position again and again, and you will find it always coming with great accuracy to the same line. Dr. Gilbert of Colchester, Physician in ordinary to Queen Elizabeth, discovered the true explanation of this wonderful phenomena to be that the earth acts as a great magnet upon the moveable needle, and this founded the science of terrestrial magnetism. But an explanation of this discovery must be reserved from a continuation of the present article. In the meantime, any reader who is sufficiently interested may experiment for himself upon the mutual influence between the bar-magnet and the floating needle, and between two needles separately magnetized and floated. 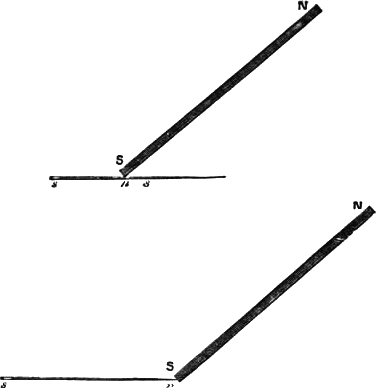 He may even readily enough anticipate Gilbert's discovery, and particularly his reasons for marking the poles N and S in the manner illustrated in the preceding sketch, which is at variance with the rule unhappily still followed by British instrument-makers, notwithstanding Gilbert's strong and early remonstrance against it. The first part of this article was written five years ago. I then thought I had a pleasant and easy task before me in the completion of it—to describe a scientific instrument which was known to the Chinese two thousand years before the dawn of science, and first used by them as a guide across the deserts of North-Eastern Asia; which for six hundred years has been in regular use by European mariners as a guide at sea; and which is now of ancient and world-wide renown as an appropriation from the most recondite province of modern physical science to the purposes of great practical utility to mankind. (It is worthy of remark, in passing, that there are just two other practical applications of electro-magnetic science extensively in use at the present day—the electric telegraph and electro-plating. these two upstarts, neither of them fifty years old, are both to-day familiar in every British household, while the venerable old mariner's compass, popular as it is in name, is not much more popularly known, in reality, now, than when Guiot of Provence described it six hundred years ago as pointing to "the star," or when Shakespeare made "lode-star" a symbol of attraction.) But when I tried to write on the mariner's compass, I found that I did not know nearly enough about it. So I had to learn my subject. I have been learning it these five years, and still feel insufficiently prepared to enlighten the readers of Good Words upon it when I now resume the attempt to complete my old article. Much confusion, and much of the difficulty now felt by practical men in understanding the elements of magnetism, has arisen through British instrument-makers having persisted up to the present day in this evil usage, notwithstanding Gilbert's strong remonstrance against it two hundred years ago. 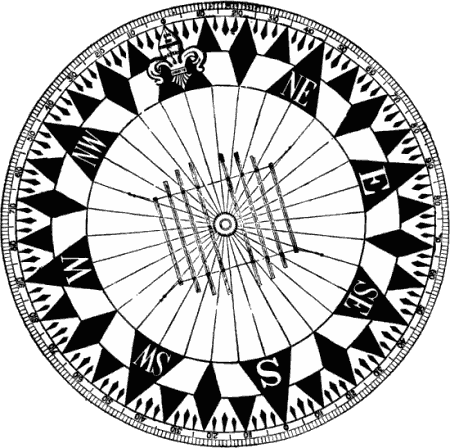 It is no doubt proper to mark on the fly-card of the compass the letters N. and S. at the points which are directed towards the north and towards the south, just as the letters E. and W. and N.E. and N.W. are marked on the card, to show the east and west and north-east and north-west directions; and thus no confusion can arise as to the indications of the mariner's compass. But when a needle or a bar of steel has letters N. and S. marked on its ends to show its magnetism, N. ought to show true North magnetism and S. true South. Gilbert gave his discovery of Terrestrial Magnetism to the world in a Latin quarto volume of 240 pages, printed in London in the year 1600, three years before his death. A second edition appeared at Stettin twenty-eight years later, edited by Lochman, and embellished with a curious title-page in the form of a monument, ornamented with commemorative illustrations of Gilbert's theory and experiments, and a fantastic indication of the earliest European mariner's compass, a floated lode-stone, but floating in a bowl on the sea and left behind by the ship sailing away from it. In the upper left-hand corner is to be seen Gilbert's terella and orbis virtutis. 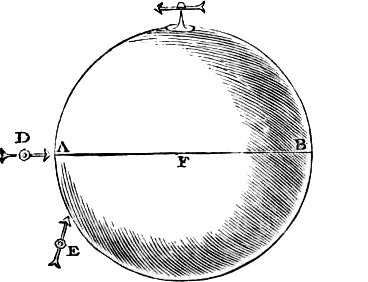 The terella is a little globe of lode-stone, which he made to illustrate his idea that the earth is a great globular magnet. Terellas have been made for the illustration of magnetic principles by the philosophical instrument-makers ever since Gilbert's time, and specimens are to be found probably in every old collection of physical lecture apparatus. The orbis virtutis is simply Gilbert's expression for what Faraday called the field of force, that is to say, the space round a magnet, in which magnetic force is sensibly exerted on another magnet, as, for instance, a small needle, properly placed for the test. Gilbert's word virtue expresses even more clearly the Faraday's word force the idea urged so finely by Faraday, and proved so validly by his magneto-optic experiment, that there is a real physical action of a magnet through all the space round it though no other magnet be there to experience force and show its effects. The meaning of the little bars bordering the terella in Lochman's frontispiece is explained near the beginning of Gilbert's book (Lib. I. Cap. iii. 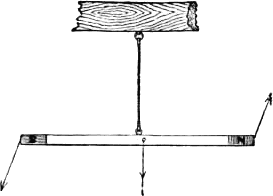 ), where he describes a very fine iron wire, "of the length of a grain of barley," placed upon a terella and standing erect from the surface at either of the two points, which he calls poles, but taking oblique positions at other points, and lying flat at any point of a circle midway between the two poles. The smallness of the magnetic indicator here allows the magnetic force to show its effect with comparatively little disturbance from gravity. The nature of the magnetic action of the terella is further illustrated by Gilbert in the annexed diagram (Fig. 33), reproduced in facsimile from his original edition. It represents the directions taken by a small magnetized steel needle, supported by a cap on a finely pointed stem, at different positions in the neighbourhood of a terella. The same results are shown more completely and more accurately by the diagram of curves shown in Fig. 34, which have been calculated mathematically from the laws of magnetic force discovered by Coulomb two hundred years after Gilbert's time. A very small magnetized needle, pivoted so as to be perfectly free to turn about its centre of gravity anywhere in the neighbourhood of a terella, will place its length exactly in the direction of the curves of the diagram through it of beside it, with its poles in the positions marked by the arrow (feather for true north pole, and point for true south). Fig. 34.—Curved lines of force. Gilbert uses the results of his observations on the direction of a small needle in the neighbourhood of a terella to explain both the horizontal direction indicated by the mariner's compass in different parts of the earth, which had been known for thousands of years, and the "dip," discovered by Robert Norman, sailor and nautical instrument-maker, a quarter of a century before the publication of Gilbert's book. Imagine the terella of the diagrams to be not a terella, but the earth itself, and by looking at the diagrams you will have, from the one showing curved lines of force, a clear idea of the general character of the directional tendency exhibited by a needle anywhere at the earth's surface, or which would be exhibited by a needle removed to thousands of miles from the earth. In experiments with a terella the needle is attracted obliquely or directly towards the globe with a very perceptible force. This is because the length of the needle is so considerable in proportion to the diameter of the globe that the magnetic forces on its two ends are not equal and parallel. But the length of the largest of mariner's compass needles is not more that about 1/40000000, and the length of the largest bar magnet that has ever been suspended so as to show by its movements any motive tendency it may experience from the force of terrestrial magnetism is not more than 1/10000000, of the earth's diameter, and therefore magnetic needles or bar magnets experimented on in any part of the world experience as wholes no sensible attraction towards, or repulsion from, the earth, and show only a directional tendency according to which a certain line of the magnet called its magnetic axis takes the direction indicated by the curved lines of force in our diagram. The word pole has been much used, but somewhat vaguely, to express a point in, or near, the surface of a body where there seems something like a concentration of magnetic action. 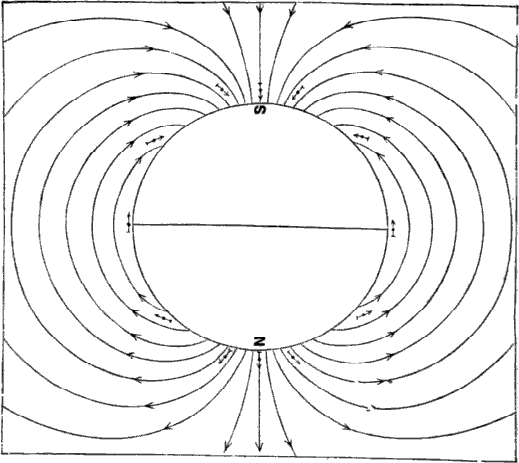 In respect to bar magnets, or magnetic needles, I shall use the term "north pole" in a perfectly definite sense to signify a certain "centre of gravity" of northern polarity, and the term "south pole" to signify similarly a "centre of gravity" of southern polarity, Thus the action of terrestrial magnetism on a bar magnet is very rigorously the same as that of two forces in dissimilar directions in parallel lines through the two poles, as illustrated in the annexed diagram; and the result, when the bar is free to turn, is that it can only rest with the line joining its poles in the direction of the lines of force. Gilbert, in respect to his terella, uses the word pole definitely, to denote either point in which the little indicating needle places itself perpendicular to the surface; and in this perfectly definite sense the word "pole" is used in the modern science of terrestrial magnetism. The north magnetic pole is the point of the earth's surface where the dipping-needle rests with its magnetic axis vertical and its true south pole downwards; the south magnetic pole is the point where the dipping-needle rests with its axis vertical and its true north pole downwards. The line of no dip, or that line round the earth at every point of which the dipping-needle is horizontal, is called the magnetic equator. At either pole a horizontal needle, supported so as to be free to turn round a vertical axis, shows no directive tendency; thus the mariner's compass altogether fails at the magnetic poles, and for hundreds of miles round them shows but very feeble directional tendency. Gilbert fell into one grand error by a dereliction from his own principles of philosophy. He assumed, without proof from observation, that the earth's magnetic poles must concide with the "poles of the world," as he calls those points which we nowadays call the true astronomical poles, to distinguish them from the magnetic poles, being, in fact, the points in which the earth's surface is cut by its axis of rotation. Modern Arctic and Antarctic explorations have shown the magnetic poles to be about 20° from the true poles. Shortly before Gilbert's time it had become known in Europe that there the needle did not point to true north, but several degrees to the east of true north, and not to the same number of degrees from the north in different places. The deviation of the needle from the true or astronomical north and south line was then called, and is called by sailors to the present day, the "variation" of the needle. Gilbert erroneously explained the different magnetic variations in different places by magnetic action of hills and headlands, and was thus led to the false conclusion that there would be no variation at great distances from the land or in the central parts of a great continent. We now know that the variation of the needle depends in the main on the fact that the magnetic axis of the earth deviates about twenty degrees from the axis of rotation, and that the amounts of the variation in different parts of the world are somewhat nearly as they would be is the distribution of terrestrial magnetism were regular as in a uniformly magnetized terella, but with its axis thus oblique to the axis of rotation. If this were exactly the case, the directions indicated by the compass would lie along great circles passing through the two magnetic poles, and the angles at which these circles cut the geographic meridians would be the actual variations in different parts of the earth, and the magnetic equator would be a circle on the earth's surface midway between the magnetic poles, inclined to the astronomical equator at an angle of 20°. But, in fact, there are irregularities of distribution, such as those adduced by Gilbert to account for variation; only we do not find them related to distributions of land and water as he imagined. It is curious to find the idea of headlands attracting the compass still cropping up again and again two centuries after it was first suggested by Gilbert, and fifty or one hundred years after advances in knowledge of terrestrial magnetism had shown it to be erroneous. I find in an unpublished letter from the late Archibald Smith to Lord Cardwell, of date 13th of February, 1866, which has been communicated to me, the following statement referring to the loss of the iron steamer Eastern Province, lost on the south coast of Africa near Cape Agulhas, on the 26th of June, 1865:—"The captain attributed the loss to a change of the deviation of the compass, and that change to an attraction of the coast, a cause to which sailors often attribute supposed irregularities of the compass on rounding a headland, irregularities which have never yet been shown to exist, and which I entirely disbelieve. It does not seem to have occurred to the captain or officers, or any one else, that a change of course is necessarily accompanied with a change of the deviation produced by the ship's iron." In the case of the Eastern Province it appeared from the captain's evidence laid before the committee of inquiry held at Cape Town on the 14th of July, to investigate and report on the loss, that the ship had been steered on a compass course of N.W by N. till off Cape Agulhas, and then on N.N.W. which the captain supposed to be a change of course of one point, which would have carried her on a course parallel to the coast. Astronomical observation had shown an error (due, of course, to the iron of the ship) of 25° W. in the compass indication on the course on which they had been steering. If the amount of the error had been unaltered by the alteration of the course, the change would have been one point, and the ship would not have gone ashore. Taking into account previous observations made in the ship, Smith found (by an application of the mathematical theory, which he had set forth in the Admiralty Compass Manual), that the change of course actually made by the captain would probably diminish the deviation from 25° to 18½°, and showed that this change fully accounted for the error in the course which caused the loss of the ship. With reference to this old question the following statement by Captain Creak, describing observations of unquestionable trustworthiness, is most interesting, and of great practical importance. It is extracted from his paper on the "Mariner's Compass in Modern Vessels of War," communicated to the Royal United Service Institute on the 31st of May, 1889. "The mariner's compass has yet another enemy to content with in the magnetic disturbance caused by proximity to land. This reported disturbing effect is not now brought forward as a novelty, in fact it is an old story often told and discredited by many whose opinions were well worthy of consideration. Well-authenticated reports of recent years show that both those who doubted and those who reported were both partly right and partly wrong. The facts are these: it is seldom, if ever, that the visible land disturbs the compasses of a ship, as her distance from the shore would almost in every case entirely keep her out of its magnetic influence. It is the submerged land near the ship's bottom which, possessed of magnetic properties, produces the observed effects, sometimes of attraction, sometimes of repulsion, on the north point of the compass. "Now, I have brought this part of the subject forward in order to place a clearly proved fact on a proper basis, and not with the view of alarming the seaman. We have now a list of localities, situated in different parts of the world, where the disturbance of the compass has been noted by trustworthy observers, and I would raise a note of warning to navigators, prone to shave corners on a dark night, guiding their ships solely by the compass, that the rocks they approach with ample water over them for the ship to float and be safe, may be so strongly magnetic as to deflect the compass, carrying the ship into serious danger if not destruction. "Observations tend to show that magnetic rocks in the northern hemisphere attract the north end of the needle, and therefore a ship nearing the land in moderate depths of water, say under twenty fathoms, on northerly courses, would be drawn nearer and nearer to them. In the southern hemisphere the converse appears to hold good, the north end of the needle being generally repelled, and a ship steering on southerly courses might be liable to close the land without her officers knowing anything about it. Two well-established examples of disturbing localities will help to illustrate the foregoing remarks, which are the outcome of considerable inquiry. "The first is the case of our surveying vessel Media, at Cossack, in North Australia. Here, with the visible land three miles off, the Media, in eight fathoms of water, running on a line of two objects on shore, had her compass steadily deflected 30° for a quarter of an our during which she sailed over half a mile. "The next instance is that furnished by observations of the variation of the compass on the east coast of Madagascar. The normal lines of the variation for several miles of the coast from St. Mary's Isle southward should be from about 11° W. to 12° W.; but instead of this the French men-of-war, which are frequently running up and down this part of the coast, find that the variation near the shore at St. Mary's Isle is only 6° or 7° W. and 12° W. at 80′ South: the north end of the compass being repelled by the magnetic properties of the bottom. These results are analogous with those of observations on shore in Madagascar, New Zealand, and other places." "Captain Creak has brought forward the question of the disturbance of the compass on approaching shore. For a long time it was thought not possible that the compass could really be disturbed. By well-known magnetic laws the sphere of influence of any disturbing forces is so small that it was thought quite impossible that the compass passing a point of land should ever be disturbed by the magnetic character of the rock. But in some extraordinary manner it has been overlooked, that while the ship is a long distance horizontally from land, she may be passing very closely vertically over it in shallow water, and it has only been recently recognised that this is the true explanation, and that there really is a danger in certain places, the majority of which are quite unknown, in passing over shallow water, of the compass being seriously deflected. I believe now that it is known it will be borne in mind." The statement regarding the Media's observation and the 30° error of the compass, over so great a length of course as half a mile, is so startling that I wrote to Captain Creak, asking further particulars regarding it, and received from him the following in a reply of date March 29, 1890. "Approaching Cossack, North Australia, on July 30, 1885, the commanding officer of the Media being sceptical of the reported 'attraction' of the Island of Bezout, near the port of Cossack, was on the look out to prove the non-existence of the disturbance, when, four miles from Bezout, in eleven fathoms, his compass was deflected two points for a short time and then returned to its proper direction. It being night the commander was not convinced, but determined to look into the matter under favourable circumstances. "September 17, 1885. The Media steering N.N.W. in very smooth water. Position by angles made the ship to be N. 58° E. from Bezout, distance three miles. Ship steered by a transit of objects on shore in eight fathoms. The first disturbance occurred when the bearing of Bezout gradually changed to S. 53° W., then the bearing gradually altered to S. 63° W., S. 75° W., and S. 89° W. This lasted for about a quarter of an hour, ship's speed two knots. The bearing then gradually returned to S. 58° W. All the officers of the ship were on deck taking bearings and angles. We were so struck by this that orders were sent out for a more extended examination, but the survey was broken up before the observations could be carried out. I have conversed with the officers since, and they have no doubt of the accuracy of their observation. "Although the observations were taken by careful observers, on board a wooden vessel, the results were so remarkable that further inquiry and examination on the spot would have been made had the vessel returned to the spot. It is desirable that further observations should by made, especially in a place where vessels approaching the port all complain of the serious disturbance to their compasses. They accuse Bezout Island. I believe it to be a magnetic ridge under the sea." "As an instance of large disturbance the results obtained at the bluff, Bluff Harbour, in the South Island, New Zealand, may be mentioned. In 1857, during the land survey by the local government officials, the following values of the declination were observed. On the summit of the bluff ..............  6° 54′ E.
30 feet north of the same position ......  9  36  W.
"    west          "            ......  5  04  E.
"    east          "            ...... 46  44  E.
Normal from sea observations ............ 16  20  E.
"On the summit of the bluff there was thus shown to be a strong focus of red magnetism. "During the survey of the South Island by the officers of H.M.S. Acheron, it was found necessary to give up the use of compass-bearings at this place, and adopt the plan of observing nothing but true bearings. "Supposing such a rock to be under water some thirty or forty feet and a vessel passing near it, one can conceive a greater deflection than 30°. Also that there may be ridges of rocks of much greater extent, and of equal power to the bluff at Bluff Harbour. In some parts of New Zealand much larger deflections have been observed." "At Highlay Hill the declination is 2° 24′ E.; in Hawksbury district, at Mount Watkins, it is 3° W.; and at Taieri Peak, a few miles to the North, it is 104° 47′ E. In Moeraki district, at trigonometrical station O, it is 26° 10′ E.; and at trigonometrical station P, it is only 50′ E.
"In Kauroo district, at Mount Difficulty, the declination is 1° o2′ W.; at trigonometrical station L., 13° 30′ E.; at trionometrical station S., 22° E.; at Black Cap, 8° 54′ W.
"These four stations are included within a radius of about two and a quarter miles; and lastly, the declination at Kauroo Hill, about five miles N.E. of Black Cap, is 41° 3′ E."
In virtue of the irregularities of the distribution of terrestrial magnetism, rightly noticed by Gilbert, but wrongly attributed to magnetic continents, and mountains, and headlands, the lines of direction indicated by the compass are not great circles on the earth's surface, but somewhat irregular curves joining the north and south magnetic poles; and the magnetic equator is not a circle, but a sinuous line round the earth. The best information regarding the configuration of these lines, at the present time, and generally regarding the present condition of the earth's magnetism, is to be found in the three small magnetic charts showing curves of equal variation, curves of equal dip, and curves of equal horizontal intensity, and in the large scale Admiralty Variation Chart, which have been prepared and reduced to the epoch of 1871 by Captain Evans, C.B., R.N., and Lieutenant (now Captain) Creak, R.N., from the results of observation in all parts of the world, collected analyzed, and exhibited, in fully detailed charts for the epoch of 1840-45, by Sir Edward Sabine, R.A., K.C.B., in the Transactions of the Royal Society. The annexed diagrams (Fig. 36) of the northern and southern hemispheres are drawn according to information taken from these charts. They exhibit, on a plan first proposed by the French navigator Duperrey, and largely used by Faraday in his drawings of lines of magnetic force, the lines of direction of the mariner's compass in different parts of the world, referred to above. A traveller starting from any point of the earth's surface and travelling always along the line shown by the compass needle, and in the direction of the north point of the compass card, would be led to a certain point in the Island of Boothia, in about 100° of west longitude, and 70° of north latitude. This point is the earth's north magnetic pole. Or, if he travels along the same line but in the contrary direction, that is to say in the direction of the south point of the compass card, he will be led to a point in about 146° of east longitude, and 73° south latitude. This point is the earth's south magnetic pole. 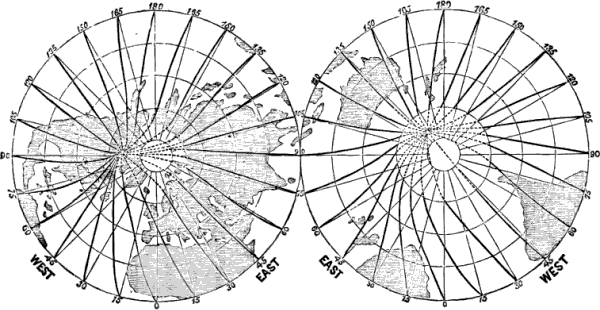 The diagram shows just two magnetic poles, and if, as is probably the case, it is approximately correct in the hitherto unexplored polar regions, Halley's celebrated hypothesis of four magnetic poles is disproved for the present time. But the dotted lines in the neighbourhood of the astronomical north and south poles are drawn conjecturally, and some degree of straining, particularly in the north polar region, is required to bring them all to pass through the points marked on the chart as the north and south magnetic poles. There is indeed a somewhat determined tendency of the lines in the explored regions of from 145° to 150° east longitude, to converge towards a point in the unexplored sea north of Siberia in about 105° east longitude, and 80° north latitude, and it seems therefore not impossible that there is in reality a north magnetic pole in that region. As for the points marked as north and south magnetic poles on the chart, the northern one was actually reached and passed by Parry and other Arctic navigators; and the southern one was so nearly reached by Sir James Ross's Antarctic expedition of 1840-41, that there can be no doubt of there being a south magnetic pole not far from the position marked. But the question whether or not there are other poles, whether north or south, besides those marked cannot be quite decisively answered without more observation, in the Arctic and Antarctic regions, than has hitherto been made. If there are really two north magnetic poles of convergence of the directional lines, there must, as shown by Gauss, be also a third pole, where the ordinary mariner's compass would show no directional tendency, and where the dipping needle would point with its true south pole vertically downwards. There would be no convergence of the directional lines to this intermediate pole, which might be called a pole of avoidance rather than a pole of convergence. Even should it turn out that there is only one north and one south magnetic pole now, it by no means follows that there may not have been at other times of the history of terrestrial magnetism more than two magnetic poles. Indeed, Halley had seemingly strong reason for inferring two north poles from observations of early navigators, showing large westerly variation of the compass in Hudson's Bay, and in Smith's Sound (longitude 80° W., latitude 78° N.), and at sea in the north-west Atlantic; at different times, from 1616 to 1682, when the compass in England was pointing due north (in the earlier part of the period a few degrees to the east of north, in the latter a few degrees to the west). It may be that the present tendency to converge to a point in the unexplored Siberian Arctic sea may be a relic of a north magnetic pole which existed in Halley's time and has since ceased to exist; but the amount of trustworthy information available scarcely suffices to justify such a conclusion. One thing is certain, the distribution of terrestrial magnetism has been changing ever since accurate observations were made upon it, and it is now enormously different from what it was in the year 1600. Observations of Gilbert's contemporaries served to bring to light for their successors, not for themselves, that great marvel of nature, the secular variation of terrestrial magnetism. Borough, Controller of the Navy of Queen Elizabeth, seems to have been the first to determine by accurate observation the variation of the compass in England. He found it to be 11° 15′ to the east of north at London in 1580. It was then imagined to be essentially constant, and Gilbert obviously had not learned that it had changed when, in 1600, he reckoned its amount as about "half a point" (or 5 5/8°). Twenty or thirty years after Gilbert's death observers began to notice that the variation had diminished considerably from the amount found for it by Borough. An accurate observation in 1633 made the variation 4° 5′, so that it seemed to have diminished by 6° 10′ in the preceding fifty-three years. In 1659 the needle pointed due north in London; in 1700 it pointed 10½° to the west of north. From 1700 to 1818 the westerly variation continued increasing, but more and more slowly, till 1820, when at an extreme westerly variation of 24½ it turned, and began to come back from west towards the north, very slowly at first, and with gaining speed ever since, till now (1879) it has become reduced to 18° 40′, and is diminishing at the rate of nearly a fifth of a degree annually. From 1605 to 1609, at the Cape of Good Hope, the variation altered from half a degree east to one-fifth of a degree west, and from that time it has been becoming more and more westerly. The needle seems now, at the Cape of Good Hope, to be returning, or about to return, towards the north, and may probably enough again point due north there a few hundred years hence. Corresponding observations as to the magnetic dip have been made at different places. After the discovery of the dip by Robert Norman in 1576, when he found its amount in London to be 71° 50′, it increased gradually till about 1723, when it was 74° 42′, and since that time it has been decreasing till it is now 67° 36′; and it is now decreasing about 2′ annually. At the Cape of Good Hope the dip (true north pole downwards) increased by 11° in the hundred years from 1751 to 1851; it has been decreasing ever since, and is still steadily decreasing. Besides these great changes in the distribution of terrestrial magnetism from century to century, there are small diurnal and annual fluctuations depending in some regular manner upon the sun's influence. It seems also that there are still smaller periodical fluctuations depending on the moon. Besides all these small periodic variations, the greatest of which does not amount to more than a small fraction of a degree in the direction whether of the compass or of the dipping-needle, or to more than a small fraction of one per cent. of the magnitude of the directing force, there are also the great irregular disturbances of terrestrial magnetism, called by Humboldt magnetic storms, amounting sometimes to as much as a degree or two on the direction, and to two or three per cent, on the magnitude, of the terrestrial magnetic force. A magnetic storm is never merely local, but is always experienced simultaneously over the whole earth and generally, perhaps always, at the same time brilliant displays of aurora are to be seen in northern and southern polar regions, often as far from either pole as our own latitudes, and sometimes perhaps as far as the equator, and over both northern and southern hemispheres simultaneously. Though it is not quite certain that there is not always a display of aurora borealis or australis, or both, at the time of a magnetic storm, it is quite certain that no display of aurora, even of the faintest to be visible, is ever seen without marked disturbances of a delicately poised magnetic needle in any part of the world. The electric telegraph has made known to us another allied disturbance—the underground electric storm—which is found always to accompany the magnetic storm and auroral display. A fourth agency, atmospheric electricity, has its storms too; and these produce great disturbances of the ordinary daily electric "earth current" discovered in every telegraph wire whether aerial or submarine. But though the thunderstorm produces disturbances of earth currents, and though disturbances of earth currents are also produced by some cause which produces also auroral displays and magnetic storms, no connection, whether of simultaneous occurrence or of distinct physical relationship, has hitherto been discovered between thunderstorms and their accompanying earth currents on the one hand, and the common cause of auroral displays, magnetic storms, and the underground electric storms with which they also are accompanied. Still another wonder—the sun-spots, and the ten and a half or eleven years' period of their alternate abundance and scantiness. It seems that in the years of most abundant sun-spots the magnetic storms have been greatly above average in frequency and in intensity; and there have also been unusually brilliant and wide-spread auroral displays. The last year of maximum abundance of sun-spots, 1870, must be remembered by many of the readers of Good Words for brilliant auroral displays. The magnificent red aurora seen on several nights in the autumn of that year in the south of England, lighting up the sky as it might have been by burning cities, were connected in the popular imagination with the horrors of the Franco-German war raging at that time on the other side of the Channel. We are now coming again to a time of abundant sun-spots which, according to the period hitherto observed, should be about the year 1881; and if again there is an abundance of auroras and magnetic storms, there will be further confirmation of the hypothesis of physical connection between the dynamical cause of those grand solar atmospheric storms which produce—we may even say which constitute—the sun spots and the hitherto mysterious telluric influences concerned in our aerial auroras and underground earth currents and surface manifestations of terrestrial magnetism. The mariner's compass consists essentially of a magnetized needle, or needles, supported in such a manner as to be free to turn round a vertical axis. The fanciful frontispiece to Lochman's edition of Gilbert's work, contains evidence of the manner of support used when the mariner's compass first became known in Europe, as recorded in Guiot de Provence's poem. The now ordinary method of support on a bearing-point and cap had probably been used by the Chinese several thousand years earlier, and in Europe, it had certainly become the practical method, both for land and sea compasses, long before Gilbert's time. In 1576 we find Robert Norman, an instrument-maker, balancing his needles and fly-card on a point, before the needles were magnetized; then magnetizing the needles, and finding the card to balance, not in its previous horizontal position, but as represented in the diagram, with a slope downwards towards the north: and from this, being a philosopher as well as sailor and instrument-maker, he went on to the important scientific discovery of the dip. As for the mariner's compass, differing from the compass for use on land only in its gimballed bowl, here is Gilbert's description of it, a literal translation of the eighth chapter of his Fourth Book, entitled "On the Composition of the Nautical Compass in Ordinary Use, and on the Difference of Compasses of Different Nations." "In a round wooden bowl closed above with glass a pin fixed upright in the middle bears the fly-card. The glass cover protects the interior against wind or any impulse of the air from without, and at the same time allows the card and inner lid of the bowl to be distinctly seen. This fly is circular and of light material, as cardboard. The magnetized needles are fixed to it below. Its upper side is divided into thirty-two spaces, commonly called points, corresponding to that number of equal angular intervals of the horizon, or of the winds, which are distinguished by proper marks and a lily to mark the north point. The bowl, with a lead weight attached to its bottom, hangs balanced horizontally in a brass ring, which, in a sufficiently complete compass, is transversely pivoted on another ring, this last being attached to a proper stand, or 'binnacle,' fixed in the ship; thus the bowl levels itself to the plane of the horizon though the ship is tossed about in various directions by the waves. "The needles are either two with their ends brought together, or one of nearly oval form with pointed ends, which performs its duty more surely and swiftly. The attachment of the needle, or needles, to the card circle is such that its centre is in the middle of the magnetic iron; but, on account of the variation of the compass from the meridian, artificers in different regions and cities connect in different ways the needles to the card in respect to their directions relatively to the thirty-two points. The first prevails in the cities of the Mediterranean, in Sicily, Genoa, and the Venetian Republic. In all those places the magnetic iron is attached to the fly-card with its length parallel to the diameter, through the rose or lily, so that at any place where there is no variation the true north and south points are shown by this diameter of the circle; and where there is variation the amount is shown by the deviation of the point marked by the lily on the card from the true north. A second prevails in Dantzic, throughout the Baltic Sea, and in the Belgian provinces. In it the needles are fixed three-quarters of a point to the east of the lily. In Russia the difference adopted is two-thirds of a point. Lastly, compasses which are made in Seville, Lisbon, 'Rupella,' Bordeaux, Rouen, and anywhere in England, have an interval of half a point between the lily and the direction of the needles. "From those differences have grown up great errors in nautical management and marine science. For when the directional positions of maritime places (as promontories, ports, islands) are first found by means of the mariner's compass, and when the height of the tide and times of high-water have been found when the moon's position was on this or that 'point of the compass' (as they call it), it is incumbent to inquire particularly in what region, or according to the usage of what region, that particular compass was made by which those directions of places and those times of tides were first observed. For, any one who with a British compass should follow tables of sailing directions published for the Mediterranean Sea must be led very far out of his straight course. So also, he who in British, or German, or Baltic waters, uses an Italian compass with the marine charts published for those places, will often be led out of his right way. Those differences in the compasses of different places were made for the purpose of avoiding error on account of the different variations in different parts of the world. Yet Peter Nonius has sought for the meridian by the mariner's compass or fly (versorium), as the Spaniards call the needle, taking no account of the variation; and he urges that there must be none by many geometrical demonstrations on foundations altogether vicious (on account of his small knowledge and experience of magnetic affairs). Likewise Peter of Medina, not admitting the existence of variation, has deformed the nautical art with many errors." The compass now in most common use at sea in all classes of ships of all nations is substantially the same as the compass made by Robert Norman three hundred years ago, and described as above by Gilbert. Happily now, however, all compasses are made according to the original Italian plan of marking the correct magnetic north direction by the lily, and thus we are now quite free from the gratuitous errors due to confusion as to the intention of the instrument-maker so deservedly condemned by Gilbert. The wooden bowl holds its place at the present day, not only in a few coasters and fishing boats, but in many old-fashioned sailing ships of high dignity. For the Admiralty standard compasses and for compasses generally in merchant steamers, the bowls are now made of copper or brass, instead of wood. The lead weight and the gimbal-rings are in all compasses just as described by Gilbert. The two varieties of needle which he describes—the pointed oval needle and the pair of thin bent needles with their ends united—made according to patterns which have survived without material change for at least three hundred years, are both still to be found at sea, though they have generally given way to safer and simpler forms recommended for the British Navy forty years ago by a scientific committee appointed to examine the compasses then in use, and to advise regarding improvements. According to the recommendation of this committee, the compass of the British Navy and of well-found merchant steamers has for its needles pairs of parallel straight bars of flat clock-spring fixed below the card, with the breadth of the bar perpendicular to the card, instead of coinciding with the under surface of the card, as in the oval needles of the older compasses. In the Admiralty standard compass there are two pairs of needles; in the compass of merchant ships, hitherto generally, just one pair attached to each card; in the compass described below there are four pairs of comparatively very small needles. Instead of the mere paper or pasteboard described by Gilbert, a thin disc of mica, with paper pasted to it on each side is used for the fly-card, as rendering it less liable to warp. The circumference of the circle is divided to degrees, and the thirty-two points of the ordinary compass are shown by bold marks a little inside the circle of degrees, as pictured in the reduced copy of a compass card at page 228. A jewelled cap fixed in the centre of the card bears the whole weight of the card and needles on a fine point of hardened steel or of a natural alloy of iridium and osmium (which is also used for the points of gold pens), being a substance much harder than steel, and not like steel liable to rust. The proper size for the compass card is a subject on which there has been great diversity of opinion and diversity of usage apparently from the beginning. Gilbert, in describing the azimuth compass of his own invention, specifies "at least a foot" as the diameter of the circle; and this is still a favourite size of compass in large merchant ships. Compasses have been made as large as fourteen or fifteen inches, and as small as four or five inches for use on board sea-going ships. The Admiralty standard compass is only seven and a half inches in diameter, and the steering compasses in the British Navy are generally still smaller. The practical experience of merchant sailors has led them to prefer larger sizes. Some of the great ocean steam navigation companies, after trying the Admiralty standard compass, and then the other extreme of fifteen-inch compasses, fell back upon ten inches. This is the size most commonly now in use for standard and azimuth compasses in preference to Gilbert's old size of twelve inches. Sailors naturally like the larger compass because it is more easily read at a distance, which, at all events for a steering compass, is a real practical advantage. Still, if the smaller compass worked better it ought to be chosen, not only for azimuth or standard compasses, but also for the steering compass, on which immediately depends the straightness of the ship's course, a result of paramount importance. But, in fact, taking compasses as ordinarily made hitherto, the smaller compasses do not work nearly so well as the larger. With similar care as to the bearing-point and cap, a tenor twelve-inch compass, while more accurate or not less accurate in respect to error arising from friction on the bearing-point, is much steadier in a heavy sea than a compass of six or seven inches diameter; and it is, in reality, practical experience of this advantage, not merely convenience of the larger card for reading azimuths on it or for steering by it, that has led to the general preference of ten-inch compasses in the British merchant service. The secret of the steadiness of a large compass is the longness of its vibrational period, and a small card would have the same steadiness as a large one if its vibrational period were the same. How little this is known is illustrated by the methods of procuring steadiness in common use. In some (as in the Admiralty "J" card, provided for use in stormy weather) there is a swelling in the middle of each of the steel needles to make them heavier; in others heavy brass weights are attached to the compass cards as near the centre as may be, being sometimes, for instance, in the form of a small brass ring of about an inch and a half diameter. Another method, scarcely less scientific, is to blunt the bearing-point by grinding it or striking it with a hammer, as has not unfrequently been done to render the compass "less lively;" or to fill the cup with brickdust, as is reported by the Liverpool Compass Committee to have been once done at sea by a captain who was surprised to find afterwards that his compass could not be trusted within a couple of points. All these methods are founded on the idea that friction on the bearing-point is the cure for unsteadiness. In reality friction introduces a peculiar unsteadiness of a very serious kind, and is very ineffective in remedying the proper unsteadiness of which something is essential and inevitable in a compass on board a ship rolling in a heavy sea, and steering on any other course than due east or due west. It has generally been considered that the greater the magnetic moment of the needles the better the compass; it is not generally known that the greater the magnetic moment, other things the same, the more unsteady will the compass be when the ship is rolling on ocean wave slopes. Froude's theory of the rolling of ships, according to which he finds that the longer the vibrational period of the ship when set a-rolling in still water by men running from side to side, the steadier she will be in a seaway, is also applicable to the oscillations of the compass produced by the rolling of the ship. The cause of these' oscillations will be readily understood by looking at the diagram on page 290, which shows a magnetized needle hung by a single vertical thread. The arrow-head in the vertical line through its middle indicates the downward resultant force of its weight or gravity through its centre of gravity. The other two arrowheads indicate the "couple" of equal contrary forces of terrestrial magnetism in parallel lines through the centres of gravity of the northern and southern polarities of its two ends, in the oblique directions in which these forces are experienced in the north magnetic hemisphere. In virtue of this magnetic couple, the needle would take an inclined position with true south pole down, and true north pole up (as represented in the diagram on page 278), if the bearing-thread were precisely in the vertical through the centre of gravity. Hence that the needle may rest horizontally, the point of attachment of the thread must be a little on the northern side of the centre of gravity, as shown in the diagram; and similarly we see that when the needle is supported by a cup on a point, as shown in subsequent diagrams, it will rest with the centre of gravity of the needle and fly-card a little to the south of the vertical through the bearing-point in the northern magnetic hemisphere, and a little to the north of this vertical in the southern magnetic hemisphere. Hence (except at the magnetic equator, where the needle rests with its centre of gravity exactly under the bearing-point), if the bearing-point be moved to and fro in the east and west horizontal direction, the centre of gravity of the card will tend to lag and again to shoot forward when the motion of the bearing-point is alternately being accelerated and being retarded. This is just what happens through the rolling of the ship when sailing on a north or south magnetic course, as the axis round which the ship is rolling is always below the position of the compass. The same action is experienced, though to a less degree, on any course not due east or due west. When a ship is sailing due east or due west, it is only through pitching that the needle can be thus disturbed, but the disturbance due to this cause, except in a very small vessel, is scarcely perceptible. There is also another cause of unsteadiness in which the rolling of the ship produces oscillations of the compass, and that is through what is called the heeling error. When the ship is inclined over to one side or other, the compass experiences a deflecting magnetic force tending to cause it to point in a different direction from that in which it points when the ship is upright. This influence which sometimes amounts to as much as two degrees for every degree of heel, is, in many cases a more potent cause of unsteadiness than the merely dynamical influence of the ship's rolling; and it is thus remarkable that, in many cases, the two influences conspire, each tending to draw, in the northern hemisphere, the north point of the compass card, and in the southern hemisphere, the south point of the compass card, to the upper side of the ship with maximum force when the inclination is a maximum; and each is greatest when the ship's head is north or south, and nearly evanescent when east or west. A little later I shall have occasion to explain the magnetic appliance for correcting the heeling error, but when it is perfectly corrected there remains a true dynamical rolling error, which alone is enough both in wooden and iron vessels, sailing or steam, to keep the compass oscillating very wildly when the ship is rolling considerably in a sea-way. When the free vibrational period of the compass card agrees with the period of the ship's rolling, a comparatively moderate degree of rolling may produce a great oscillation in the card. Now the longest period of actual rolling, to any considerable degree, in a sea-way is from fourteen to seventeen or eighteen seconds. The vibrational period of the "A" card of the Admiralty standard compass is, in this part of the world, about nineteen seconds, and that of the larger compass (ten-inch) of the merchant steamers about twenty-six seconds; and it is certainly owing to the nearer agreement of the former than of the latter with the period of the ship's rolling, that in a heavy sea the Admiralty compass is more disturbed than the ten-inch compass in the merchant steamers. But to get satisfactory steadiness a much longer period still than the twenty-six seconds is necessary. Now, for the same weight and dimensions of compass card and needles, the smaller the magnetic moment of the needles' magnetism the longer will be the vibrational period. 1. For steadiness a very long vibrational period with small frictional error. 2. Short enough needles to allow the correction to be accurate on all courses of the ship for the place where the adjustment is made. 3. Small enough magnetic moment of the needles to allow the correction of the quadrantal error to remain accurate to whatever part of the world the ship may go. This problem forced itself on me when I tried to write an article on the mariner's compass for Good Words five years ago, and hence it is that the article is not written until now. When there seemed a possibility of finding a compass which should fulfil the conditions of the problem, I felt it impossible to complacently describe compasses which perform their duty ill, or less well than might be, through not fulfilling these conditions. The accompanying diagram (Fig. 39) represents the solution at which I have arrived. Eight small needles of thin steel wire, from 3¼ inches to 2 inches long, weighing in all 54 grains, are fixed (like the steps of a rope-ladder) on two parallel silk threads, and slung from a light aluminium circular rim of 10 inches diameter by four silk threads through eyes in the four ends of the outer pair of needles. The aluminium rim is connected by thirty-two stout silk threads, the spokes as it were of the wheel, with an aluminium disk about the size of a fourpenny-piece forming the nave. A small inverted cup, with sapphire crown and aluminium sides and projecting lip, fits through a hole in this disk and supports it by the lip; the cup is borne by its sapphire crown on a fine iridium point soldered to the top of a thin brass wire supported in a socket attached to the bottom of the compass bowl. The aluminium rim and thirty-two silk-thread spokes from a circular platform which bears a light circle of paper constituting the compass card proper. Habitually, however, the whole movable piece which turns to the north, consisting of magnets, supporting frame-work, jewelled cap, and, in the ordinary compass, pasteboard or mica with paper pasted on it, is called for brevity the "card," or the "compass card." In the new compass the outer edge of the paper circle is notched and folded down along the outside of the aluminium rim; pasted to tissue paper, with which the aluminium rim is firmly coated, so as to give a perfectly secure attachment; and bound all round with narrow silk ribbon to prevent the paper from cracking off in any climate. For the sake of lightness a circle of 6 inches diameter is cut away from the middle of the paper, leaving an annular band, 2 inches broad, on which are engraved the points of the compass and a circle divided to degrees. The paper ring is cut across in thirty-two places, midway between the silk-thread spokes, to prevent it from warping the aluminium rim by the shrinkage it experiences when heated by the sun. Compass cards of the new kind made before this simple piece of engineering was applied to the structure, used to be perfectly flat in cloudy weather at sea, and to become warped into a saddle-shape surface when the sun had shone brightly on them for a few minutes. Now with the radical cuts in the paper the compass may be first thoroughly moistened by the steam of a kettle, and then toasted before a hot fire, without in any sensible degree warping the aluminium rim or disturbing the degree or point divisions printed on the paper; and in its proper place under glass in its bowl it remains quite undisturbed through all variations of temperature from coldest weather to hottest sun in actual sea-service. Aluminium rim . . . . . . . . .  76 grains. Eight needles . . . . . . . . .  54   "
Aluminium nave  . . . . . . . .   2   "
Aluminium and sapphire cap  . .   2½  "
Paper . . . . . . . . . . . . .  28   "
Silk thread . . . . . . . . . .   8   "
Total . . . . . . . 170½  "
This is a seventeenth of the weight of the ordinary ten-inch compass hitherto in common use in the best-found merchant steamers, which is about six ounces. On the other hand, the vibrational period of the new ten-inch compass, which at Glasgow is about forty-two seconds, is nearly double that of the ordinary ten-inch compass. 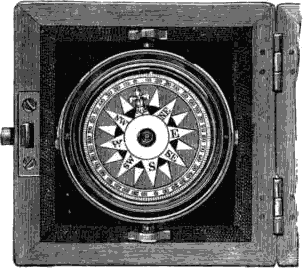 The frictional error of the new compass when tested in the most severe manner—that is to say, by experiments on shore with the bowl resting on a perfectly steady support, first bringing a magnet near it so as to deflect the card several degrees, and then withdrawing the magnet so as to allow it to come back very slowly towards its true position of magnetic equilibrium—is not more than a quarter of a degree. The whole magnetic moment of the eight needles of the new card is only about one-thirteenth of that of the two needles of an ordinary 10-inch card, and is so small that the error due to its inductive influence on the iron globes used for correcting the quadrantal error is practically insensible, even in such extreme cases as when the quadrantal error corrected amounts to 10° or 15°. The theoretical anticipation of advantage from the long vibrational period in giving steadiness at sea has been fully confirmed by three years' experience in iron sailing ships and steamers, some crossing the Atlantic, and others making voyages through the Mediterranean and round the Cape to India, China, and back by the West Indies, or to Australia and New Zealand. To produce steadiness of the compass-card in steamers which have powerful engines, and where there is much vibration, it has been customary to suspend the bowl by means of india-rubber bands. A serious objection to this method is that the india-rubber is liable to become rotten by exposure to heat or oil, especially if it is used in fine enough bands to give the requisite steadiness in all circumstances. After many trials of metallic springs in lieu of india-rubber, I at last found a plan of brass spring resembling a rope grummet, but with elastic brass wire instead of the rope strands, by which I succeeded in obtaining more satisfactory steadiness of the compass than with india-rubber. The construction of this brass grummet-ring and the mounting of the compass-bowl upon it, may be described as follows:—A single wire is first bent and its ends are united by soldering or brazing, so as to form a ring of the proper size. This serves as a core on which a second brass wire is laid on spirally, six turns round the core. The ends of this second wire are also united by soldering or brazing, and thus an elastic ring is produced strong enough to support the compass-bowl. The compass-bowl is suspended from the elastic ring with the intervention of a rigid gimbal ring. The elastic ring has two sockets fixed at the ends of a diameter, which rests on two balls attached to the brass rim of the binnacle stand. The elasticity of the ring mitigates the effect on the knife-edges bearing the gimbal ring and bowl, and on the point bearing the compass-card, of vertical tremors of the platform on which the binnacle rests. The knife-edges of the gimbal ring are supported on two grooved stirrups, hung by chains from the elastic rings. This suspension mitigates the effect of horizontal tremors of the platform. The most difficult and not the least interesting part of my subject remains, the deviation of the compass produced by magnetization of the ship herself, or of iron in her fittings or cargo, and practical appliances for relieving of these errors the compasses of iron ships; but limits of space prevent me from more than very slightly touching on it in the present article. The magnetism of a ship's iron is a very variable property, and it is almost as difficult to classify and describe it in words as it is to correct its effect on the compass. It may be imagined to consist of two constituents:—one permanent; the other transient, because dependent on transient inductive influences. But the "permanent magnetism" is not perfectly permanent, and therefore it is called "sub-permanent," or it is imagined as consisting of two parts, a thoroughly permanent part and a sub-permanent part. Then again, the "transient magnetism" is not perfectly transient, but is sub-permanent. If the permanent magnetism were perfectly permanent, and the transient magnetism perfectly transient according to changes of the influence to which it is due, it would be easy to apply magnets and iron in the neighbourhood of the compass, so that, whatever might be the position of the ship, whether upright or heeling over, or in whatever part of the world she might be, the needle should point in exactly the same direction, and exhibit precisely the same return force when deflected from this direction, as it would were there no iron in the ship. It is only because of the approximate permanence of one part of the ship's magnetism, and the approximate transience of the other, that the compass can be used at all in an iron ship as a guide for her course in the intervals between observations of sun, or moon, or stars. For the sake of simplicity, and to avoid circumlocutions, I shall first describe the effects on the compass of the ship's magnetism, and explain how they are to be corrected on the supposition of perfect permanence and perfect transientness of its two constituents; and afterwards shortly explain how the mariner must be constantly on his guard to determine and allow for unpredictable irregularities in his compass due to variations of the permanent magnetism, and to retention of some of the transient magnetism when the inducing influence is past. The ship's permanent magnetism produces at the place of the compass a constant force in a direction which is constant relatively to the ship wherever she goes and however she turns. This force may be balanced by an equal and opposite force produced by a permanent magnet fixed in a proper position in the neighbourhood of the compass. Again, the transient magnetism induced in the ship's iron by the earth's magnetic force, however the ship may vary in position, whether by turning horizontally of heeling over in one place, or by going to different places on the earth's surface, may be balanced by an equal and opposite force due to magnetism induced in a properly shaped mass of soft iron fixed in a proper position in the neighbourhood of the compass. Were our temporary supposition of perfect permanence and perfect transientness of the two constituents of the ship's magnetism rigorously correct, it would be quite practicable to thoroughly and accurately perform the whole adjustment. The measurements and calculations required to allow this to be done for any particular ship are only such as, in the process technically called "swinging the ship," and in the subsequent calculation of the numbers A, B, C, D, E in Archibald Smith's theory as set forth in the Admiralty Manual, are regularly performed at frequent intervals for every ship of the British Navy, with the addition that they would have to be performed not only, for the ship upright, but also with a list of 10° or 15° to either side. If the supposition we have made for a moment as to perfect definiteness of quality of the ship's magnetism were true, the whole of this process could be actually carried out in practice, and the labour required to move loads across the deck of the ship or shift cargo in the hold, so as to give her the requisite list to one side or other, would be well repaid by getting her compasses perfectly corrected once for all. But, alas! the compass is not to be corrected perfectly once for all by any possible operations or observations, however accurately performed. The ship's permanent magnetism gradually changes, more or less rapidly according to circumstances, and readjustment becomes necessary; sooner generally in a new ship, but sooner or later in every ship. The labour and expense of "swinging" the ship both upright and with a list to either side, as it cannot give a perfect and permanent adjustment of the compass, is scarcely compensated by the approximate and merely temporary approach to perfection obtainable by the complete process. Accordingly swinging the ship when heeled over is rarely performed in practice, but swinging on even keel is done regularly for every new ship, and at regular or irregular intervals, according to circumstances, for all iron ships in the course of their service. To "swing" a ship is a technical expression which means to turn her round with her head successively on all points of the compass, and determine the error of the compass for a sufficient number of different courses to allow it to be estimated with sufficient accuracy for every course. With plenty of sea room and with clear enough sky to see sun, moon, or stars, or with complete enough compass marks on land in view, the process is best performed under way. When the ship is to be swung, and it is not practicable or not convenient to do so under way, she must be taken to some place where there is little or no tidal current, and there anchored, and by aid of a tug or tugs, or by warps and anchors or fixed moorings and buoys laid out in proper positions, turned round all points of the compass and detained on each point on which the error is to be observed, or observed and corrected, long enough to allow the observation to be made and the requisite adjustment performed. A very simple method of taking advantage of this process not merely to determine the errors of the compass, but to annul them, which was worked out and published so long ago as 1837 by the Astronomer-Royal, Sir George Airy, has been in practical use, more or less, ever since. It consists in first placing steel magnets in proper positions within a few feet of the compass to correct the error on the north or south, and on the east or west courses, and then applying soft iron to correct a residual error, which is still found after the compass has been corrected on the cardinal courses. This residual error Airy called the quadrantal error, because it has its maximum value in either direction when the ship's head is on one or other of the four quadrantal points, N.E., S.E., S.W. and N.W. 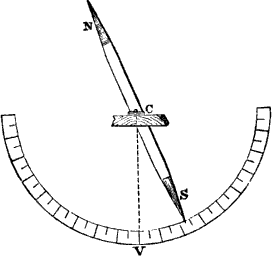 The great lengths and the great magnetic moments of the needles hitherto used in the marine compass rendered it practically impossible for the latter part of Sir George Airy's method to be carried out correctly in practice, except in cases in which the quadrantal error was much smaller than it generally is in modern iron ships. The primary object of my new form of compass described above, is to permit complete correction of the quadrantal error, not merely when its amount is from 5° to 7° or 8°, which it generally is in iron sailing ships or steamers of ordinary modern types; but even when it amounts to as much as 15° or 20°, as it is sometimes found to be in ironclads. A complete realization of Airy's method is thus now for the first time rendered practically possible for all classes of ships. The whole method essentially includes some plan for gradually changing the positions of the correcting magnets at sea to correct on the north, or south, or east, or west course when error is found to have sprung up, whether through change in the ship's sub-permanent magnetism, or of the magnetism induced in her by the vertical component of the terrestrial magnetic force changing with her geographical position. The binnacle of my new compass contains appliances, for making, with ease and certainty, the proper changes in the adjustment of Airy's steel magnets, whenever observation shows change to be necessary. It has also an adjustable appliance for placing properly a steel magnet below the centre of the compass to correct the heeling error, according to a subordinate but still very important part of his complete method of correction. My binnacle has also appliances for placing and fixing once for all a pair of iron globes in proper positions on the two sides of the compass to correct the quadrantal error. When the globes for correcting the quadrantal error have been once properly placed, no change of this adjustment is ever necessary for the same ship, and the same position of the compass in it, except in the case of some change in the ship's iron, or iron cargo, or ballast, sufficiently near the compass to sensibly alter the quadrantal error. But the magnetic correctors for the semicircular error and the heeling error must be adjusted from time to time to keep the compass correct. Lastly it has an appliance for fixing on the forward or after side of the binnacle a bar of soft iron to realise conveniently a most important but long strangely neglected correction, given so long ago as 1801 by Captain Flinders. This last appliance has been very successful in ships of the Peninsular and Oriental and Cape Mail Services. In the Union Steamship Company's ship Durban (Captain Warleigh), for instance, the first to which it was applied in connection with my compass, an error of 34° degrees growing up in the voyage from England to Algoa Bay, and disappearing on her return to England, has been corrected by a Flinders bar attached to the front side of the binnacle, and the ship now goes and comes through that long voyage with no greater changes of compass error than might be experienced in the same time in a ship plying across the Irish Channel. The Flinders bar supplied with the compass is a round bar of soft iron, 3 inches in diameter, and of whatever length of from 6 inches to 24 inches is found to be proper for the actual position of the compass in any particular ship. To make up the proper length it is supplied in pieces of 12 inches, 6 inches, 3 inches, 1½ inches, and two pieces of 3/4 of an inch. In making up the proper length the longest piece should be uppermost and the others below it in order of their lengths. 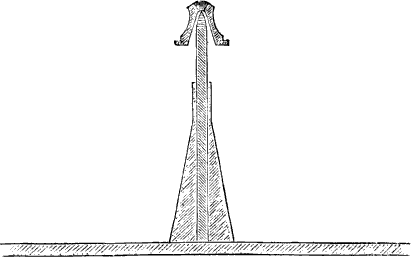 The weight of the bar is supported on a wooden column or bar resting on a pedestal fixed to the binnacle near its foot, this wooden bar being cut to such a length, or so made up of pieces, as to give the proper height to the upper end of the iron bar. The compound column of iron and wood is kept in position and protected from rain and spray by a brass tube with upper end closed, going down over it. The main object of the Flinders bar is to counterbalance the component of the ship's horizontal force on the compass, which is due to magnetism induced by the vertical component of the terrestrial magnetic force. Hence, in all ordinary cases, the ship's iron being symmetrical on the two sides of the fore-and-aft midship vertical plane, and the compass being placed in this plane, the Flinders bar must be placed in it also, and therefore must be exactly in the middle of the front side, or of the after side, of the binnacle. The Flinders bar essentially corrects, wholly and permanently, the constituent of the heeling error, which has its maximum values on the east and west courses. A subordinate object of the Flinders bar, as supplied to my compass, is to partially correct the constituent of the heeling error, which has equal maximum values on the north and south courses, by partially counterbalancing the component force on the compass, perpendicular to the ship's deck, exerted by that part of the ship's magnetism which is induced by the vertical component of the earth's magnetic force. For this object also the proper position of the bar is up and down in the middle of the forward or after side of the binnacle; but for it the bar should be lowered a little below, or raised a little above, the position in which, without altering the length of the bar, it gives its maximum horizontal force on the compass. When it is not desired to make this contribution to the heeling correction by the Flinders bar, it should be placed with its top about 2 inches above the level of the needles of the compass-card. To understand the action of the Flinders bar suppose first the ship to be anywhere in the northern magnetic hemisphere. The vertical force there is such as to pull the red end or pole of a magnetized needle downwards, and to repel the blue end upwards. It also has the effect of inducing magnetism in any mass of iron, so as to give it a transient magnetic quality marked with blue on the upper side or end and red on the lower side or end. Thus, in the northern magnetic hemisphere the Flinders bar is transiently magnetized by the earth's vertical force in such manner that it acts like a great bar-magnet with its upper end blue and its lower end red. At the magnetic equator it loses its magnetism, and in the southern magnetic hemisphere it acquires magnetism in the opposite direction to that which it had in the northern hemisphere; so that now its upper end is red and its lower end blue. As the ship moves from one hemisphere across the magnetic equator to the other, the magnetism of the Flinders bar gradually diminishes to zero, and then increases gradually in the contrary direction. The object to be attained in applying it to the binnacle is that with this gradual change of its magnetism, it shall always as exactly as possible counterbalance the changing part of the force on the compass, due to the part of the chip's magnetization which changes with the gradual change of the vertical component of the terrestrial magnetic force. If this changing part of the ship's disturbing force on the compass is a pull aft in the northern magnetic hemisphere, and a pull forward in the southern magnetic hemisphere, the Flinders bar must be on the forward side of the binnacle. On the other hand, if the regularly changing part of the ship's force be a pull forward in the northern hemisphere, and aft in the southern hemisphere, the Flinders bar must be on the after side of the binnacle. The former is the most frequent case for the chief navigating standard compass and for the steering compass of modern mail steamers and merchant steamers generally, in which the steering and conning of the ship is done on a bridge forward of the engines, with considerably more than half of the ship behind it. It is also almost certain to be the case for an after steering compass, a few feet in advance of the top of the iron stern-post and rudder-head, in an iron steamer or sailing ship. The second above-mentioned case is what will generally be found for a compass anywhere in the after half of the ship's length, to within two or three yards of the stern-post. Most frequently it is not possible to ascertain which of the two is the actual case until the ship has made a voyage through regions presenting considerable differences of vertical magnetic force. Suppose now the first adjustment to have been made somewhere in the northern magnetic hemisphere, and suppose that as the ship goes to places of weaker vertical force, the fore-and-aft correcting force required to make the compass correct on the east or west points, is found to be less than at the beginning of the voyage. It is clear that part of the correction made by the magnets ought to have been made by the Flinders bar. But nothing need be done except to diminish the fore-and-aft pull by the magnets, as long as the ship is going to places of weaker vertical force. If without touching or crossing the magnetic equator the ship returns again to places of stronger vertical force, and if it is found that increased longitudinal pull is now required, this should be applied, not by the magnets, but by introducing a Flinders bar or by increasing the bar already in position. Correct the deviations found by observation on the east or west courses by the fore-and-aft magnets when the ship is going to places of weaker, and by the Flinders bar when she is going to places of stronger, vertical force, whether in the southern or northern hemisphere. After a few voyages the proper proportion of correction by Flinders bar to correction by bar-magnets will be practically realized. For a ship with a compass permanently relieved of quadrantal error, and with a binnacle provided with these appliances for adjustment, the regular management of the compass at sea becomes very simple. Whenever an error exceeding two or three degrees is ascertained on any course, it may be corrected by a slight readjustment of the correcting magnets, performed in such a manner as not to disturb the direction which the needle would show if the ship were steered on a course at right angles to that on which the error is found. Occasionally, when the weather is favourable, a ship at sea should be steered for a few minutes three or four points first on one side and then on the other side of her proper course, and the compass corrected on each of the extreme courses by such a movement of the correcting magnets as shall not disturb its adjustment on the other. When this is done the compass will be correct on every course, provided always the ship remains on even keel. In the case of a steamer the detention involved by this process is always less than a quarter of the whole time which it occupies; for, while steaming in a direction 42° (or 3½ points) off her proper course, she is diminishing the distance from her destination at three-quarters of the rate at which she diminishes it when on her course. Three minutes' detention by steering three or four points on each side of the course for ten minutes to correct the compass every day of suitable weather would be more than compensated by the security against compass errors thus afforded. But the detention will, in fact, generally be far more than made up by the straighter course which the ship will be enabled to steer; and thus, even if importance is attached to the saving of minutes on the whole passage, this will be promoted by taking time to correct the compass. In page 14 of Lochman's edition there is a curious error in this diagram, which is repeated in page 80, the needle is the equatorial position being shown with the arrow-head intended to denote its true south pole turned towards the south instead of towards the north of the terella. Lochman's wood-engraver generally reversed Gilbert's diagrams as to right and left (giving, for example, a remarkable picture of a blacksmith wielding with his left hand a hammer to strike a piece of iron on the anvil, as a reproduction of Gilbert's picture which shows a blacksmith working with his right arm), and seems to have corrected the reversal for two of the needles, and omitted to do so for the other, in his diagrams of the terella. Transactions of New Zealand Institute, 1873, vol. vi, p. 7. Such a country as this submerged to eight fathoms would trouble our compasses very considerably.—CAPTAIN CREAK. [Note added August, 1890.] Since 1881 the rate of diminution of the westerly variation in London has become less than half what it was from 1879 to 1880. The variation in 1890 is 17° 26′ west. This opinion of Gilbert's is not borne out by advanced knowledge of the laws of magnetization, which show that the oval ring needle cannot be trusted to for keeping its magnetic axis securely in a constant direction under whatever disturbing influence it may be subjected to, as does a thin rod or bar. The oval form was authoritatively condemned on this account by the British Admiralty Committee of 1837, who found the theoretical objection simply confirmed by experience. They actually found compasses of this pattern, which had been in use for some time at sea, presenting errors of as much as three degrees on account of the displacement of the magnetization in the substance of the needle. [Note added June, 1890.] This was the case from about 1840 till the end of 1889, when my ten-inch compass described below was adopted as the Admiralty standard compass. "Magnetic moment" is the proper expression for what in common language is often called "power," or "strength," of the needles. The free vibrational period, or simply "the period" (as it may be called for brevity) of a compass, is the time it takes to perform a complete vibration to and fro, when deflected horizontally through any angle not exceeding 30° or 40°, and left to itself to vibrate freely. Fifteen ships are reported by the Liverpool Compass Committee as having had this correction applied to their steering compasses with more or less complete success, but in every instance with decidedly good result. It was also applied with remarkable definiteness and success to a compass in the ss. City of Mecca, by Captain Lecky, on a voyage between Bombay and the Clyde some years ago. An error of 14°, found in the English Channel on the east and west courses, after the compass had been perfectly corrected by Airy's method a few weeks previously on the magnetic equator, was corrected by a vertical soft iron pillar, fixed to the ship in the neighbourhood of the compass. The result, proved in subsequent voyages of the ship, was most satisfactory. I know no other cases in which the Flinders process had been used in iron ships before I commenced practising the process myself in 1878. The earth's surface is divided into two parts, called the northern and southern magnetic hemispheres, by a line called the magnetic equator, which is the line of no dip. This line is not a great circle like the true equator, but a sinuous line north of the true equator in all east longitude, and from 180° to 173° of west longitude; and south of the equator in all west longitude less than 173°. Its greatest distance on either side of the equator is where it cuts the coast of Brazil in about 17° south latitude. Its greatest distance north of the equator is in the Indian Ocean, which it crosses from Africa, a little south of Cape Guardafui, to the south of India, very nearly along the 10° parallel of north latitude and eastward across the mouth of the Bay of Bengal to the Malay Peninsula, still but little short of this degree of north latitude. A chart of lines of equal magnetic dip, such as the very convenient small scale one of the Admiralty Compass Manual, should be carefully studied. The change of polarity in vertical bars in the ship, which takes place in crossing the magnetic equator, has sometimes been falsely supposed to be abrupt, and mistakes in respect to compass courses have been made in consequence. "Vertical force" is a short expression for the vertical component of the earth's magnetic force. It is reckoned as positive when the direction of its action upon a red pole is downwards, as in the northern hemisphere; and negative when upwards, as in the southern hemisphere. At the magnetic equator it is zero. The amount of the vertical force at any place is calculated by multiplying the value of the horizontal force given by the chart of lines of equal horizontal force of the Admiralty Manual by the tangent of the dip as given by the chart of lines of equal magnetic dip. Thus, for example, the tangent of the dip for the south of England being 2.44, and the horizontal force there being called unity, the vertical force there is 2.44. The tangent of the dip at Aden is .09, and the horizontal force is 1.95; hence the vertical force there is .1755, or about 1/14 of the vertical force at the south of England.